I grew up with four brothers. It is an understatement to describe our house[s] as raucous, loud and unruly. Teasing was our favorite indoor sport and no topic was sacred. I will not repeat the repartee when one of my sisters bought her first training bra. My mother was an avid bridge devotee and she had several friends over a couple of times a week to play. My brothers had a special name for these older ladies. They called them “the Raisins”. The aging process is relentless. There is no “Backspace” or even a “Pause” button on the keyboard of life. There are only drugs and disguises. Drugs to soothe the inevitable pain; disguises to mask the indignities. Vanity shifts from an option to an impossible yearning. There is no lemonade that can be made from rotting fruit. And, contemporary society has played a cruel joke on the process of aging. At the same time that modern life-styles and medicine have increased life spans, contemporary values have placed an even greater premium on youth. The faces and bodies in advertisements are getting younger and younger. Silicon Valley is making millionaires and billionaires out of twenty-somethings. You cannot go to a gym and simply work out. You have to attend a “boot camp”; flip a truck tire; hang yourself upside down from a bar; bring yourself to exhaustion in a spinning class. What the hell happened to the gentle jog? I, for one, think that liver spots, wrinkles, scars and white hair are the merit badges of life. We earn them and should be proud of them. Those without them are no more than “Tenderfoot” Cub Scouts on their way to Eagle. My son, Carter, graduated from Vassar, that great college in Poughkeepsie, and one of the “Seven Sisters”. It was wonderful to attend seminars with aging alums and hear their conversations and perceptions. They distinguished themselves by their classy looks; impeccable dress, no facelifts, no dye jobs. That’s why I enjoyed an essay by Frank Bruni in the Arts & Leisure section of last Sunday’s Times. He interviewed one of my favorite actors, Frances McDormand. I have been a fan since first seeing her as the pregnant, waddling detective in the Coen brothers’ Fargo in 1996. She has great acting “chops”, an insightful mind and resolute looks. She discussed with Bruni her views on aging and the obstacles placed by contemporary society. I remember when, in 2008, I accepted the job as CEO of USA Track&Field at the age of 65. My cousin called me to congratulate me and then asked, in all seriousness, whether I was going to dye my hair. It took a great effort to answer in the negative in a civil manner. This past weekend we saw an “adult” athlete, Peyton Manning of the Denver Broncos, break Brent Favre’s NFL career touchdown record. I vividly remember the first time I met him. I was invited to attend the 1998 ESPY Awards, and my host, ESPN, seated me next to this soon to be University of Tennessee graduate. We chatted through the two or more hours of the show. I remember being impressed with his intelligence, poise, but most of all, his maturity. You could just tell he would do something special in his life. His preparation for games is legendary. His teammates, both on the Indianapolis Colts and on the Broncos, have treated him as a “coach-on-the-field”, the consummate “adult-in-charge”. 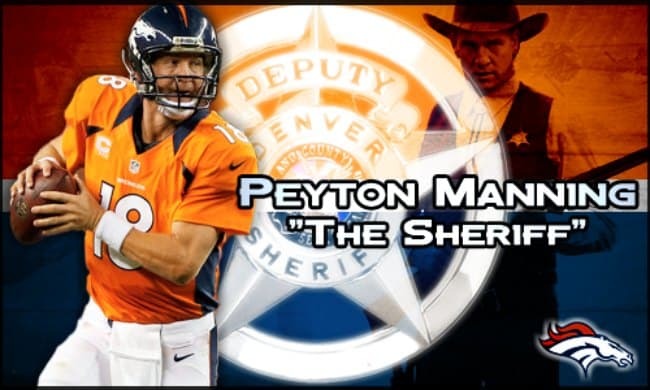 That’s why his nickname is “the Sheriff”. In this era of immature acts by professional athletes it is refreshing to acknowledge the feats of one who revels in his adulthood. Societal respect for elders is not always accepted with gratitude. Several weeks ago, Carter and I took the subway to Brooklyn for a concert. All the seats were taken and we stood, hanging from a pole. Suddenly, a nice woman in her 50’s gestured to me and asked whether I wanted her seat. I first looked around to see whether she was talking to someone else. She wasn’t. I politely demurred and muttered some oath under my breath. I looked out of the corner of my eye to see if Carter was smiling. The good son pretended nothing had happened.